A Dusting of Sugar: Daring Bakers (somewhat unenthusiastically) - "Beautiful Bread"
Daring Bakers (somewhat unenthusiastically) - "Beautiful Bread"
Welp. I want to start off by apologizing for not posting for like three weeks. I sort of have an excuse for part of it. I was planning on doing a post about something Valentinesy/be romantic on all the days, not just one, but I awoke at 3:45 AM on February 15th, violently, violently ill. TMI, I vomited six times that night. I was totally wiped out for the next few days, and I am so glad my parents were around to take care of me so I didn't wither away and die. Thanks, parents. So I was kind of not in the mood for eating for a bit after that. I'm completely better now (though many of my friends are becoming ill... >__>) so I'll be posting more. Okay, so...this month's Daring Bakers had a lot of potential in my mind. The challenge was just to make some kind of beautiful bread. 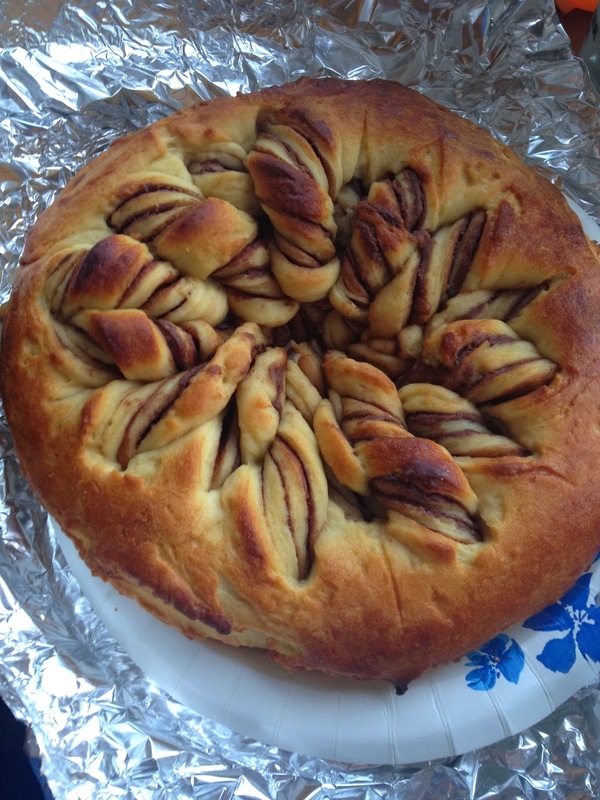 I made a nutella swirl bread that kind of looked like it had unicorn horns in it. The recipe made two breads and the first one was a DISASTER. I didn't realize the top layer needed to be wrapped around the other layers, so I kind of just ended up with this burnt, ugly stack of pancake bread. The second one was better, but in my opinion...not worth the effort. It didn't taste like anything special I used the extra dough to make some killer cinnamon rolls, and they were way better than the pretty breads. Oh well, live and learn, right? I guess it's kinda cool. Add the flour one cup at a time and knead using the kneading attachment or by hand till you get a soft dough. The dough will be slightly sticky due to the sweetened condensed milk, don’t worry once the dough rests it will have a wonderful consistency. Punch down the dough and divide it into 2 parts. Wrap one part in a plastic bag and work with the other. Divide the dough ball into 4 parts. Roll each part into a circle at least 20 cm (8 inch) in diameter (you can use a plate or any other round item as a template if you want your layers to be identical and uniform). Spread the Nutella (or similar filling) on the first layer. Place the second layer on top of the first and repeat. Top with the fourth layer, this time only brush it with butter. NOTE: to help with the slippery Nutella, you can place the filled layers before cutting into the fridge for 20-30 minutes, this will help the nutella to firm up. That will make the cuts and twists easier. Using a knife make cuts that divide the dough circles into 8 triangles starting at the center but don’t go all the way to the outer edge.I find that using a ruler to mark the dough makes the cuts easier and more uniform. You can also dip your knife in flour before cutting, that helps to prevent the layers from sticking together. I have also found that a pizza cutter works well because it is extra sharp (I used a bench scraper). Then divide each triangle into two. That gives you a total of 16 triangles. Gently lift the triangles one at a time and twist them. Brush the dough with egg wash replacement. Bake at moderately hot 390°F/200°C/gas mark 6 and for 20-25 minutes. The original instructions say to put it under the broiler for five minutes, but I had bad luck with that. The bread still looks gorgeous! Sorry you lost your other pics--that's so frustrating! I'm sorry you didn't like your bread that much, but it's beautiful anyway. The recipe for cinnamon sweet bread was perfect and the bread was very delicious and I bet you would like it. I hate losing photos! It's the worst. Your bread looks beautiful, sorry you were disappointed in it. But glad you're recovered from sickness! Have a lovely weekend. Shucks, thanks guys. I feel like a whiny baby now, haha. Glad to hear you're feeling better! You may think that's nothing special, but I feel that's a gorgeous bread! Nice job! !